2) Mr. Davis sings that his girlfriend was "bad with her pom-poms." Presumably she was a cheerleader. Share one of your school's cheers. We are the Wolves, we are the mighty mighty wolves. Hey, hey, hey, hey. Stand up. *clap, clap*..Be Proud. *clap, clap*...Say your name..*clap, clap*..out loud....WE ARE THE WOLVES!!!! *This cheer is still done and was a cheer when I was cheering in high school years ago. 3) The lyrics tell us he believes that if he could go back in time, his girl would still be his. If you could travel back in time to your high school years, what would you enjoy doing again? What would you do differently? I would enjoy going to the football games and cheering. I wouldn't change a thing. It was a good experience for me. 4) During his performing days, Paul Davis sported a full beard and flowing hair. We're using that to check your powers of observation and recollection. Think of the last man you spoke to. Who was he? Describe his hair, and tell us whether he was clean shaven. My husband is the last man I spoke to since he is right here with me. He has short thick red hair and is cleanly shaven. 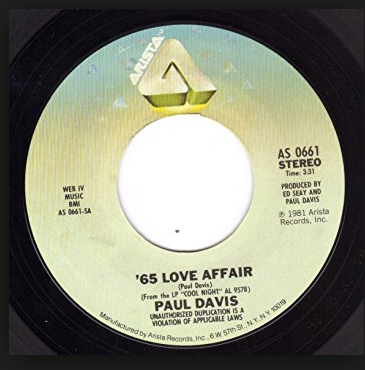 5) Paul Davis was born in Meridian, MS, and that's where he returned to when he went into semi-retirement in 1982. Meridian's biggest employer is the Naval Air Station in Meridian. Do you know anyone who is currently in, or employed by, the military? My nephew is in the National Guard. He is employed at the airport as a helicopter mechanic for the military. 6) He was a pool player and a golfer. Which sport are you better at? pool I guess, but I am terrible at both. 7) Sadly, he died in 2008, on the day after his 60th birthday. His best friend remembers him as "a homebody," who enjoyed staying up long into the night with his friends, playing and listening to music. Describe your perfect way to spend an evening. Watching tv with family and relaxing. 9) Random question --You're at a party and one of your host's best friends is a real egghead who tries to draw you into a conversation about paradigmatic counter existentialism. Would you: a) just listen politely while letting your mind wander; b) admit you don't know what the hell he's talking about; c) explain why you personally feel that the counter existential paradigm just adds unnecessary complexity to the individual's search for meaning? A. I would probably listen. I tend to listen to what people have to say. I would probably be so bored with this conversation though. I am always jealous of people who have red hair! Your cheer is great! Opposing schools would laugh at our cheer, "Maroon? Who has that color as a school color? ", etc. But, that's what we were stuck with! You have the sweetest #9. And yes, it is boring for anyone anymore. The people who adhere to it have talked the whole gambit into the ground, too be honest. Have a lovely week, with much tv and relaxing. It's good for people to do.. I completely blanked on the cheers. I love yours! I think you would do great with either of your choices, animals or education. You have a heart for both. My thanks to your nephew for his service. Fun questions and how cool that you were a cheerleader! I am impressed that you remember a cheer. And you remember it well too! Before I retired one of my employees was in the National Guard as a electronic technician.